In 1993, the Maine Legislature established the Voluntary Response Action Program (VRAP). The VRAP allows applicants to voluntarily investigate and cleanup properties to the Department's satisfaction, in exchange for protections from Department enforcement actions. The VRAP is intended to encourage the cleanup and redevelopment of contaminated properties within the state. For more information about VRAP contact Nick Hodgkins at (207) 592-0882. 38 MRSA 3001, et seq, Uniform Environmental Covenants Act (UECA) establishes the requirements for writing and recording Declarations of Environmental Covenants, which are required at all VRAP sites that include engineering and/or institutional controls as part of the remedy. 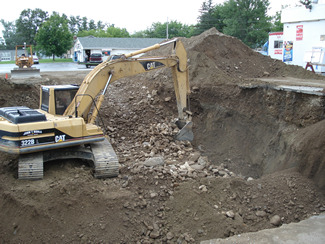 The Division of Remediation Sites List - the public record of sites in the Division of Remediation, including all VRAP sites. Sample UECA template – (MS Word format) to be used as a template for drafting Declarations of Environmental Covenants. Each document will need to be modified to reflect site specific circumstances and need to be reviewed by the VRAP and/or the Attorney General’s Office before being finalized, but this template contains boilerplate language that will appear in any document that is consistent with statute.